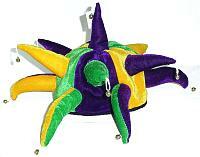 Crazy is the look at Mardi Gras, and this hat certainly works! Bold purple, green & gold spikes coming from every side! (13 spikes in all) But don't buy this one if you don't want to "stick out"! The hat is approximately 8" in diameter without the spikes, and 5" tall. Each spike is 4.5" long, and is adorned with a small bell at the end.